FITCHBURG —Thanks to the generosity of numerous supporters and donors, Monty Tech’s new Veterinary Science Training Center is fast becoming a reality. One such supporter was at the school recently to donate masonry materials and to give students a demonstration on their use. David P. Croteau, founder and VP of sales for Stoneyard in Littleton, manufacturers and installers of stone veneer siding, conducted a demonstration on the latest process of installing stone veneer. The students will be installing the stone on the entrance to the new building, going up on school grounds. James J. Hachey, Monty Tech Director of Vocational Programs, said Mr. Croteau is also donating the bonding materials and loaning the tools to cut and shape the stone. “He also gave us a great discount on the stone. We are very grateful for his assistance and support. “In addition to demonstrating how to cut and install the stone, Mr. Croteau also showed how to use the latest bonding materials, which are resistant to the elements. Masonry teacher Jake Proctor explained that working with stone veneer is a new process for the students. “These are new skills for our students, and we are very fortunate to have Dave donate his time and expertise to show them the latest method for doing this type of work. 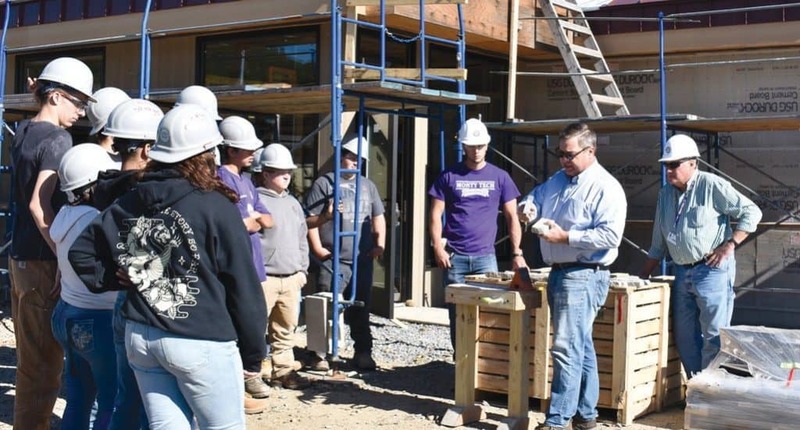 Stonework is one of the hottest things in the trade right now, so the students are very fortunate to get to work on a project like this,” he said. Superintendent-Director Dr. Sheila M. Harrity attended the demonstration and thanked Mr. Croteau for his generosity and support. She told him that the new building, which will house the school’s newest and 21st vocational program, focusing on Veterinary Science, is being funded through private donations and assistance from business partnerships such as Stoneyard. “We really appreciate your efforts,” she said. In addition to installing the stone veneer, the students will also be doing tile work inside the building.